All thermal power generation requires water for cooling, with nukes so vulnerable no private insurer will cover them anyway and failing frequently in recent heat waves. “Natural” gas is no better than coal or oil for water use; maybe worse because all those pipelines vulnerable to backhoes or corrosion or attack. Even hydro is vulnerable to lack of rainfall. Carbon sequestration doesn’t get good marks, while conservation and efficiency get rave reviews from a study of insurance perspectives on power generation. What’s the one power source this article about insurance risks does not say is fragile in the face of climate change? Hint: look up. Limiting Liability in the Greenhouse: Insurance Risk-Management Strategies in the Context of Global Climate Change, by Christina Ross, Evan Mills, and Sean B. Hecht, Stanford Environmental Law Journal and the Stanford Journal of International Law, Symposium: on Climate Change Risk, Vol. 26A/43A:251, 2007. Supply-side energy choices that may be made to reduce the carbon-intensity of energy services have their own distinctive liability characteristics. For example, switching to lower-carbon electricity generation technology based on thermal power plant technology (e.g., by substituting natural gas for coal) results in systems that are still heavily dependent on water resources for cooling. The Electric Power Research Institute has documented considerable risks to traditionally cooled power generation systems as a result of climate change-induced droughts.242 Similarly, “zero-emissions” hydroelectric generating systems are also sensitive to rainfall patterns. 242 Denis Albrecht, Electric Power Research Institute, Presentation: Climate Impact on Water Availability for Electricity Generation (April 11, 2006) (presentation slides associated with the Electric Power Research Institute). 243 MUNICH REINS. GROUP, supra note 127, at 13. 244 Frederick E. Nelson, Oleg A. Anisimov & Nikolay I. Shiklomanov, Subsidence Risk from Thawing Permafrost, 410 NATURE 889 (2001). 245 Eugene L. Lecomte with Anna W. Pang & James W. Russell, Ice Storm ’98, 1-2 (Institute for Catastrophic Loss Reduction Research Paper Series — No. 1, 1998) available at http://www.iclr.org/pdf/icestorm98_english.pdf. 246 MUNICH REINS. GROUP, supra note 127, at 5. 2 ENV’T ALERT BULL. 3 (2004), available at http://www.grid.unep.ch/product/publication/download/ew_heat_wave.en.pdf. Some centralized power sources are worse than others, and nuclear gets the most condemnation. 250 See Press Release, Department of Energy, Department of Energy Releases Global Nuclear Energy Partnership Strategic Plan (Jan. 10, 2007), available at http://www.gnep.energy.gov/gnepPRs/gnepPR011007.html. 251 Steven Pacala & Robert Socolow, Stabilization Wedges: Solving the Climate Problem for the Next 50 Years with Current Technologies, 305 SCIENCE 968, 969 (2004). 252 Atomic Energy Act of 1954, 42 U.S.C. sect;2011.23 (2006), as amended by Price-Anderson Act, 42 U.S.C. §2210 (2006). For more information, see U.S. GOV’T ACCOUNTABILITY OFFICE, NUCLEAR REGULATION: NRC’S LIABILITY INSURANCE REQUIREMENTS FOR NUCLEAR POWER PLANTS OWNED BY LIMITED LIABILITY COMPANIES (2004), available at http://www.gao.gov/new.items/d04654.pdf. 253 MUNICH REINS. GROUP, TOPICS GEO: ANNUAL REVIEW: NATURAL CATASTROPHES 2003, 23 (2004), available at http://www.munichre.com/publications/302-03971_en.pdf?rdm=6512. 254 Amelia Gentleman, France Faces Nuclear Power Crises, GUARDIAN, Aug. 13, 2003, available at http://www.guardian.co.uk/international/story/0,3604,1017262,00.html. And nukes haven’t stopped being down due to heat, for example Millstone 2 down for two weeks in Connecticut in August 2012, four nukes in New York, Pennsylvania, Maryland, and South Carolina in July 2012, and of course there’s Pilgrim in Massachusetts, down repeatedly for cold, heat, and leaks. In Europe in August 2013, nukes in France, Germany, and Spain were down due to heat. Now Georgia Power wants more new water for Vogtle nukes than Savannah uses. As Jeremy Rifkin spelled out in September 2012, there’s no business future in nuclear power. Let’s stop burning $20 bills to generate electricity. There has also been a recent wave of interest in capturing carbon dioxide at the point of production and storing it, hopefully safely and permanently, via injection into the earth or seabed. The risks are many, as illustrated in Exhibit 8: Risks of geologic storage of carbon dioxide,255 but the liabilities of this largely untested sequestration technology remain essentially unquantified.256 There is evidence that leakage, for example, can pose a serious threat to public health and the environment: for example, a natural carbon dioxide leak at Lake Nyos in Cameroon in 1986 killed at least 1,700 people and 3,000 cows.257 Politicians have already taken steps to shield providers of these services from liability, raising serious public policy concerns.258 Sequestration could pose potential risks particularly in the developing world, where it will be most needed due to the relatively high growth in coal-based power generation, and may generate significant liabilities, including hazards to public health, if quality control is relaxed during construction or operation of these complex facilities. 255 See Exhibit 8: Risks of Geologic Storage of Carbon Dioxide (CO2). 256 Elizabeth J. Wilson & Mark A. de Figueiredo, Geologic Carbon Dioxide Sequestration: An Analysis of Subsurface Property Law, 36 ENVTL. L. REP. 10114 (2006); Elizabeth J. Wilson, Timothy L. Johnson, & David W. Keith, Regulating the Ultimate Sink: Managing the Risks of Geologic CO2 Storage, 37 ENVTL. SCI. & TECH. 3476 (2004). 257 George W. Kling et al., The 1986 Lake Nyos Gas Disaster in Cameroon, West Africa. 236 SCIENCE 169 (1987). 258 Obey, supra note 31. Hydrogen energy systems also have unknown liabilities. Over twenty-two percent of hydrogen accidents associated in industrial settings have been caused by undetected leaks. These accidents occurred in spite of occupational safety and health measures in place, including standard operating procedures, special training, personal protective equipment, and provision of electronic flame and gas detectors to a limited number of hydrogen workers.259 The liability insurance lines that may be affected by new technologies include those discussed above in Section III.B. In particular, new technologies are likely to spawn claims either in negligence, or in strict liability for product defects, depending on the type of technology. 259 Russell Moy, Letter to the Editor, Liability and the Hydrogen Economy, 301 SCIENCE 47 (2003). While arguably not as “brittle” as centralized thermal power systems, even renewable energy systems can have their own vulnerabilities. Windstorm is a hazard for most renewable systems (whether centralized or distributed), particularly wind-power systems, which are intentionally placed in the greatest wind corridors.260 Conversely, wind resources could shift geographically, thereby stranding prior investments. Hydroelectric power systems are clearly dependent on precipitation, runoff conditions, and limited siltation rates, and may thus be impacted by changing climatic conditions, such as flooding. Biomass-based systems are vulnerable to loss or interruptions of fuel supply due to drought, wildfire, flooding, infestations or disease, and other hazards impacting fuel distribution or growing areas. Nonetheless, while these new technologies will pose risks to the insurance sector, the risks are less than those from continuing past practices. 260 UNITED KINGDOM CLIMATE IMPACTS PROGRAM, BUILDING KNOWLEDGE FOR A CHANGING CLIMATE: THE IMPACTS OF CLIMATE CHANGE ON THE BUILT ENVIRONMENT (2003). Wind off the Atlantic Coast in the Georgia Bight would have to weather hurricanes. 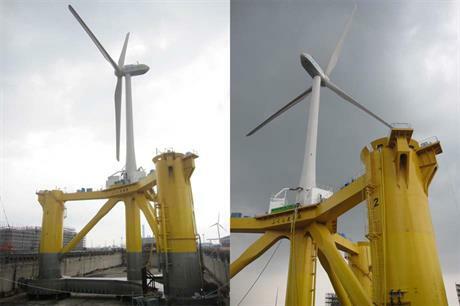 But TEPCO, owner of the failed Fukushima nuclear plant, is already deploying floating windmills designed to weather typhoons. 261 Evan Mills, The Insurance and Risk Management Industries: New Players in the Delivery of Energy-Efficient Products and Services, 31 ENERGY POL’Y 1257 (2003). 262 See EVAN MILLS & IVO KNOEPFEL, ENERGY-EFFICIENCY OPTIONS FOR INSURANCE LOSS— PREVENTION, at 9, 12 (1997), available at http://eetd.lbl.gov/emills/PUBS/no-regrets.html. http://energy.lbl.gov/ea/emills/pubs/pdf/mills-knoepfel.pdf. 263 MARC ROSS & TOM WENZEL, AN ANALYSIS OF TRAFFIC DEATHS BY VEHICLE TYPE AND MODEL, U.S. Dep’t of Energy, LBNL Report No 49675 (2002), available at http://eande.lbl.gov/EA/teepa/pdf/LBNL-49675.pdf. 264 See Letter from Katherine A. Siggerud, Director, Physical Infrastructure Issues, U.S. Government Accountability Office, Underinflated Tires in the United States (Feb. 9, 2007), available at http://www.gao.gov/new.items/d07246r.pdf. The article goes on to criticize carbon trading. But guess which energy source gets no criticisms? That’s right: solar power wasn’t criticized at all. It’s not centralized, it uses no water, and it’s not especially susceptible to wind or storms. Sure, solar panels don’t generate much during a thunderstorm, but other panels elsewhere keep generating, and after the storm passes the ones it covered start generating again. Utilities can’t take the solar heat. Let’s get on with solar power, which weathers everything better than any other power source. Add mostly wind and some water power, and we can power the country and the world entirely with renewable power. This entry was posted in Climate change, Coal, Economy, energy conservation, energy efficiency, Environment, Georgia Power, Natural gas, Oil, Pipeline, Solar, Water, Wind and tagged Climate change, Coal, Economy, energy conservation, energy efficiency, Environment, fragility, Georgia, Georgia Power, insurance, Kemper Coal, LAKE, Lowndes Area Knowledge Exchange, Lowndes County, natural gas, Oil, pipeline, Plant Ratcliffe, Plant Vogtle, reinsurance, Savannah, Solar, Valdosta, Water, Wind on May 25, 2014 by John S. Quarterman. This article has been posted to the Greening Georgia FB page. The next entry is how the the US House of Representative have passed legislation that would not allow the use of any of this information by the US Military. This is the federal version of North Carolina’s multiple laws against considering risks of global change. George Orwell would be proud.